Mischa really wishes she could speak english, judging by her behavior alone. Until then, she's stuck barking her orders. Cue the drums and cymbal. Mostly, she "talks" about eating and going to bed, but as we have had a lot of snow this winter, a new topic of conversation has been added to her list of daily complaints. Mischa is not fond of the snow. I have gotten her to go outside in it on occasion, when there is an inch or less, but this winter there has been too much and she's small. Having snow halfway up her legs is a deal breaker. Years ago when she was a puppy my mom bought her little boots but she hated them. I think we got two on before she figured out how to take them off and ran away to hide under some piece of furniture. We have had the same "conversation" every day that I've been home this week, and twice already this morning. Mischa runs to the door, starts hopping up and down, and barks at me. I tell her that there is still snow outside and she's not going to be happy. She doesn't care and continues hopping and barking. I then open the door, she takes a quick peek outside at the snow covered yard and freezes. To her surprise the snow has not melted. She then slowly backs away from the door and runs in the opposite direction. I should probably mention that she is extremely lazy, has an indoor bathroom, and is the kind of dog that sits down halfway through a walk and demands to be carried the rest of the way because she "doesn't feel like it anymore". This makes me giggle. My dog talks all the time. You can tell she gets soooo frustrated that she can't speak human. Awwww she makes me miss my yorkie Chuck that I had growing up! 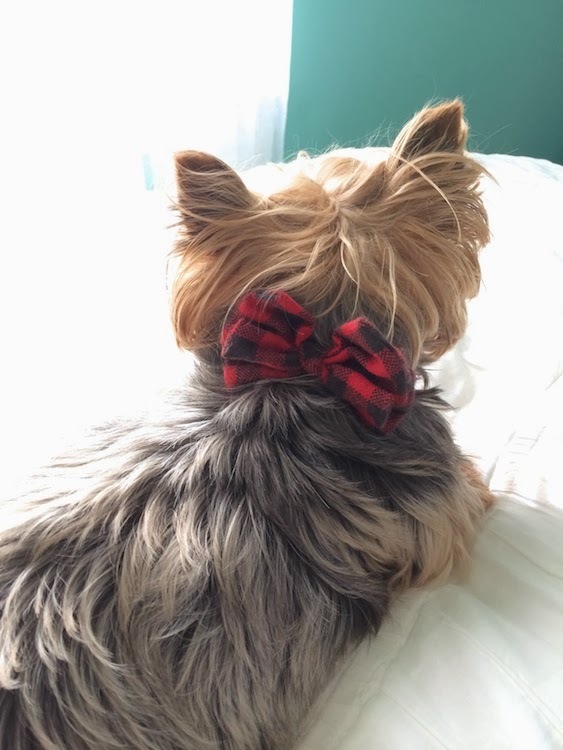 That bow is so adorable!! !